a 90-Day programme where you’ll articulate, action and achieve your goals! Transform your business and achieve those goals you've had on the back-burner for too long! We provide you with the support and templates you need to achieve all your goals - creating a system you can use time and time again. and do some hard work over the next 3 months? The secret to achieving goals is to reduce your overwhelm. We’ll break down your goals into doable tasks so that every day you know what you need to be working on, and in what order. We’ll create the magic of momentum to help you achieve not only your current goals, but learn how to apply the system to future goals. Are you ready to turn that wishlist of yours into reality? We pull your ideas out of your head and onto paper with a questionnaire designed to help us get the most out of our strategy session together. 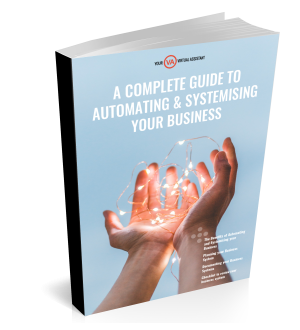 We’ve included a free ebook walking you through the fundamentals of systemizing and automating your business systems. This plan sets out for you the tasks you need to accomplish over the next 3 months in order to achieve your goals. We’ll set up the entire action plan in ASANA so you can track your progress and delegate tasks in order to reach your milestones. We'll be checking in with you by email to see how you are tracking and to answer any questions you have. Full accountability to help you stay focused when things get crazy! At the end of 3 months, we’ll have a second recorded Zoom to review your goals and touch on your next steps. [recorded on Zoom for your future reference] During which we go into more detail about your ideas, your wishlist, what you want to achieve, and together turn these into measurable SMART goals. This program is intensive and it delivers. Are you ready to invest in your business? *WANT TO CHAT TO A REAL PERSON? If you are not quite convinced and have any questions about this offer, then just use the chat at the bottom right of this screen. We'll be more than happy to answer your queries. We’ve worked with small business owners since 1998 so there's a few things we already know about you. You’re ambitious, dedicated, have a strong work ethic and a willingness to roll up your sleeves to grow your business. You’re also frustrated with your inability to grow the business and you lack accountability because you’re working for yourself, often by yourself. So we get it, we understand you, we understand what you need. Together we can meet your milestones.